The word Puranas (/pʊˈrɑːnəz/; Sanskrit: पुराण, purāṇa) literally means "ancient, old", and it is a vast genre of Indian literature about a wide range of topics, particularly myths, legends and other traditional lore. Composed primarily in Sanskrit, but also in regional languages, several of these texts are named after major Hindu deities such as Vishnu, Shiva and Devi. The Puranas genre of literature is found in both Hinduism and Jainism. They have been influential in the Hindu culture and other regional cultures, inspiring major national and regional annual festivals of Hinduism. Their role and value as sectarian religious texts and historical texts has been controversial because all Puranas praise many gods and goddesses and "their sectarianism is far less clear cut" than assumed, states Ludo Rocher. The religious practices included in them are considered Vaidika (congruent with Vedic literature), because they do not preach initiation into Tantra. The Bhagavata Purana has been among the most celebrated and popular text in the Puranic genre, and is of non-dualistic tenor. The Puranic literature wove with the Bhakti movement in India, and both Dvaita and Advaita scholars have commented on the underlying Vedantic themes in the Maha Puranas. Douglas Harper states that the etymological origins of Puranas are from Sanskrit Puranah, literally "ancient, former," from pura "formerly, before," cognate with Greek paros "before," pro "before," Avestan paro "before," Old English fore, from Proto-Indo-European *pre-, from *per-." Vyasa, the narrator of the Mahabharata, is hagiographically credited as the compiler of the Puranas. The ancient tradition suggests that originally there was but one Purana. Vishnu Purana (3.6.15) mentions that Vyasa entrusted his Puranasamhita to his disciple Lomaharshana, who in turn imparted it to his disciples,[note 1] three of whom compiled their own samhitas. These three, together with Lomaharshana's, comprise the Mulasamhita, from which the later eighteen Puranas were derived. "The rk and saman verses, the chandas, the Purana along with the Yajus formulae, all sprang from the remainder of the sacrificial food, (as also) the gods that resort to heaven. He changed his place and went over to great direction, and Itihasa and Purana, gathas, verses in praise of heroes followed in going over." Similarly, the Shatapatha Brahmana (XI.5.6.8) mentions Itihasapuranam (as one compound word) and recommends that on the 9th day of Pariplava, the hotr priest should narrate some Purana because "the Purana is the Veda, this it is" (XIII.4.3.13). However, states P.V. Kane, it is not certain whether these texts suggested several works or single work with the term Purana. The late Vedic text Taittiriya Aranyaka (II.10) uses the term in the plural. Therefore, states Kane, that in the later Vedic period at least, the Puranas referred to three or more texts, and that they were studied and recited  In numerous passages the Mahabharata mentions 'Purana' in both singular and plural forms. Moreover, it is not unlikely that, where the singular 'Puranam' was employed in the texts, a class of works was meant. Further, despite the mention of the term Purana or Puranas in the Vedic texts, there is uncertainty about the contents of them until the composition of the oldest Dharmashastra Apastamba Dharmasutra and Gautama Dharmasutra, that mention Puranas resembling with the extant Puranas. According to Thomas Coburn, Puranas and early extra-puranic texts attest to two traditions regarding their origin, one proclaiming a divine origin as the breath of the Great Being, the other as a human named Vyasa as the arranger of already existing material into eighteen Puranas. In the early references, states Coburn, the term Purana occurs in singular unlike the later era which refers to a plural form presumably because they had assumed their "multifarious form". While both these traditions disagree on the origins of the Puranas, they affirm that extant Puranas are not identical with the original Purana. According to the Indologists J. A. B. van Buitenen and Cornelia Dimmitt, the Puranas that have survived into the modern era are ancient but represent "an amalgam of two somewhat different but never entirely different separate oral literatures: the Brahmin tradition stemming from the reciters of the Vedas, and the bardic poetry recited by Sutas that was handed down in Kshatriya circles". The original Puranas comes from the priestly roots while the later genealogies have the warrior and epic roots. These texts were collected for the "second time between the fourth and sixth centuries A.D. under the rule of the Gupta kings", a period of Hindu renaissance. However, the editing and expansion of the Puranas did not stop after the Gupta era, and the texts continued to "grow for another five hundred or a thousand years" and these were preserved by priests who maintained Hindu pilgrimage sites and temples. The core of Itihasa-Puranas, states Klaus Klostermaier, may possibly go back to the seventh century BCE or even earlier. It is not possible to set a specific date for any Purana as a whole, states Ludo Rocher. He points out that even for the better established and more coherent puranas such as Bhagavata and Vishnu, the dates proposed by scholars continue to vary widely and endlessly. The date of the production of the written texts does not define the date of origin of the Puranas. They existed in an oral form before being written down. 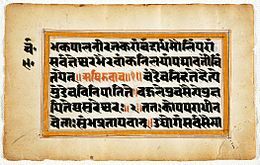 In the 19th century, F. E. Pargiter believed the "original Purana" may date to the time of the final redaction of the Vedas. Wendy Doniger, based on her study of indologists, assigns approximate dates to the various Puranas. She dates Markandeya Purana to c. 250 CE (with one portion dated to c. 550 CE), Matsya Purana to c. 250–500 CE, Vayu Purana to c. 350 CE, Harivamsa and Vishnu Purana to c. 450 CE, Brahmanda Purana to c. 350–950 CE, Vamana Purana to c. 450–900 CE, Kurma Purana to c. 550–850 CE, and Linga Purana to c. 600–1000 CE. 2 Bhagavata 18,000 verses The most studied and popular of the Puranas, telling of Vishnu's Avatars, and of Vaishnavism. It contains controversial genealogical details of various dynasties. Numerous inconsistent versions of this text and historical manuscripts exist, in many Indian languages. Influential and elaborated during Bhakti movement. 5 Brahmavaivarta 18,000 verses It is related by Savarni to Narada, and centres around the greatness of Krishna and Radha. In this, the story of Brahma-varaha is repeatedly told. Notable for asserting that Krishna is the supreme reality and the gods Vishnu, Shiva, Brahma are incarnations of him. Mentions geography and rivers such as Ganga to Kaveri. 6 Garuda 19,000 verses An encyclopedia of diverse topics. Primarily about Vishnu, but praises all gods. Describes how Vishnu, Shiva and Brahma collaborate. Many chapters are a dialogue between Vishnu and the bird-vehicle Garuda. Cosmology, Describes cosmology, relationship between gods. Discusses ethics, what are crimes, good versus evil, various schools of Hindu philosophies, the theory of Yoga, the theory of "heaven and hell" with "karma and rebirth", includes Upanishadic discussion of self-knowledge as a means of moksha. Includes chapters on rivers, geography of Bharat (India) and other nations on earth, types of minerals and stones, testing methods for stones for their quality, various diseases and their symptoms, various medicines, aphrodisiacs, prophylactics, Hindu calendar and its basis, astronomy, moon, planets, astrology, architecture, building home, essential features of a temple, rites of passage, virtues such as compassion, charity and gift making, economy, thrift, duties of a king, politics, state officials and their roles and how to appointment them, genre of literature, rules of grammar, and other topics. The final chapters discuss how to practice Yoga (Samkhya and Advaita types), personal development and the benefits of self-knowledge. 12 Padma 55,000 verses A large compilation of diverse topics, it escribes cosmology, the world and nature of life from the perspective of Vishnu. It also discusses festivals, numerous legends, geography of rivers and regions from northwest India to Bengal to the kingdom of Tripura, major sages of India, various Avatars of Vishnu and his cooperation with Shiva, a story of Rama-Sita that is different from the Hindu epic Ramayana.The north Indian manuscripts of Padma Purana are very different from south Indian versions, and the various recensions in both groups in different languages (Devanagari and Bengali, for example) show major inconsistencies. Like the Skanda Purana, it is a detailed treatise on travel and pilgrimage centers in India. The Padma Purana, Uttara Khanda (236.18-21), classifies the Puranas in accordance with the three gunas or qualities; truth, passion, and ignorance. The Ganesha and Mudgala Puranas are devoted to Ganesha. The Devi-Bhagavata Purana, which extols the goddess Durga, has become (along with the Devi Mahatmya( from Markandey Purana) and Mahabhagavata Purana/also called Devi Purana) a basic text for Devi worshipers. The Skanda Purana has received renewed scholarly interest ever since the late 20th-century discovery of a Nepalese Skanda Purana manuscript dated to be from the early 9th century. This discovery established that Skanda Purana existed by the 9th century. However, a comparison shows that the 9th-century document is entirely different from versions of Skanda Purana that have been circulating in South Asia since the colonial era. The Puranas, states Flood, document the rise of the theistic traditions such as those based on Vishnu, Shiva and the goddess Devi and include respective mythology, pilgrimage to holy places, rituals and genealogies. The bulk of these texts in Flood's view were established by 500 CE, in the Gupta era though amendments were made later. Along with inconsistencies, common ideas are found throughout the corpus but it is not possible to trace the lines of influence of one Purana upon another so the corpus is best viewed as a synchronous whole. An example of similar myths woven across the Puranas, but in different versions, include the lingabhava – the "apparition of the linga". The story features Brahma, Vishnu and Shiva, the three major deities of Hinduism, who get together, debate, and after various versions of the story, in the end the glory of Shiva is established by the apparition of linga. This myth, state Bonnefoy and Doniger, appears in Vayu Purana 1.55, Brahmanda Purana 1.26, Shiva Purana's Rudra Samhita Sristi Khanda 15, Skanda Purana's chapters 1.3, 1.16 and 3.1, and other Puranas. The relation of the Puranas with Vedas has been debated by scholars, some holding that there's no relationship, others contending that they are identical. The Puranic literature, stated Max Muller, is independent, has changed often over its history, and has little relation to the Vedic age or the Vedic literature. In contrast, Purana literature is evidently intended to serve as a complement to the Vedas, states Vans Kennedy. Some scholars such as Govinda Das suggest that the Puranas claim a link to the Vedas but in name only, not in substance. The link is purely a mechanical one. Scholars such as Viman Chandra Bhattacharya and PV Kane state that the Puranas are a continuation and development of the Vedas. Sudhakar Malaviya and VG Rahurkar state the connection is closer in that the Puranas are companion texts to help understand and interpret the Vedas. K.S. Ramaswami Sastri and Manilal N. Dvivedi reflect the third view which states that Puranas enable us to know the "true import of the ethos, philosophy and religion of the Vedas". Barbara Holdrege questions the fifth Veda status of Itihasas (the Hindu epics) and Puranas. [note 9] The Puranas, states V.S. Agrawala, intend to "explicate, interpret, adapt" the metaphysical truths in the Vedas. In the general opinion, states Rocher, "the Puranas cannot be divorced from the Vedas" though scholars provide different interpretations of the link between the two. Scholars have given the Bhagavata Purana as an example of the links and continuity of the Vedic content such as providing an interpretation of the Gayatri mantra. Newly discovered Puranas manuscripts from the medieval centuries has attracted scholarly attention and the conclusion that the Puranic literature has gone through slow redaction and text corruption over time, as well as sudden deletion of numerous chapters and its replacement with new content to an extent that the currently circulating Puranas are entirely different from those that existed before 11th century, or 16th century. For example, a newly discovered palm-leaf manuscript of Skanda Purana in Nepal has been dated to be from 810 CE, but is entirely different from versions of Skanda Purana that have been circulating in South Asia since the colonial era. Further discoveries of four more manuscripts, each different, suggest that document has gone through major redactions twice, first likely before the 12th century, and the second very large change sometime in the 15th-16th century for unknown reasons. The different versions of manuscripts of Skanda Purana suggest that "minor" redactions, interpolations and corruption of the ideas in the text over time. Many of the extant manuscripts were written on palm leaf or copied during the British India colonial era, some in the 19th century. The scholarship on various Puranas, has suffered from frequent forgeries, states Ludo Rocher, where liberties in the transmission of Puranas were normal and those who copied older manuscripts replaced words or added new content to fit the theory that the colonial scholars were keen on publishing. ^ The early Buddhist text (Sutta Nipata 3.7 describes the meeting between the Buddha and Sela. It has been translated by Mills and Sujato as, "(...) the brahmin Sela was visiting Āpaṇa. He was an expert in the three Vedas, with the etymologies, the rituals, the phonology and word analysis, and fifthly the legendary histories". ^ This text underwent a near complete rewrite in or after 15th/16th century CE, and almost all extant manuscripts are Vaishnava (Krishna) bhakti oriented. ^ Like all Puranas, this text underwent extensive revisions and rewrite in its history; the extant manuscripts are predominantly an encyclopedia, and so secular in its discussions of gods and goddesses that scholars have classified as Smartism, Shaktism, Vaishnavism and Shaivism Purana. ^ a b c d This text is named after a Vishnu avatar, but extant manuscripts praise all gods and goddesses equally with some versions focusing more on Shiva. ^ a b Hazra includes this in Vaishnava category. ^ This text includes the famous Devi-Mahatmya, one of the most important Goddess-related text of the Shaktism tradition in Hinduism. ^ a b c Scholars consider the Sattva-Rajas-Tamas classification as "entirely fanciful" and there is nothing in each text that actually justifies this classification. ^ There are only four Vedas in Hinduism. Several texts have been claimed to have the status of the Fifth Veda in the Hindu tradition. For example, the Natya Shastra, a Sanskrit text on the performing arts, is also so claimed. ^ a b Collins, Charles Dillard (1988). The Iconography and Ritual of Śiva at Elephanta. SUNY Press. p. 36. ISBN 978-0-88706-773-0. ^ a b Thompson, Richard L. (2007). The Cosmology of the Bhagavata Purana 'Mysteries of the Sacred Universe. Motilal Banarsidass Publishers. p. 10. ISBN 978-81-208-1919-1. ^ a b Ludo Rocher (1986). The Purāṇas. Otto Harrassowitz Verlag. pp. 45–. ISBN 978-3-447-02522-5. ^ a b c Thomas B. Coburn (1988). Devī-Māhātmya: The Crystallization of the Goddess Tradition. Motilal Banarsidass. pp. 23–27. ISBN 978-81-208-0557-6. ^ P. V. Kane. History of Dharmasastra (Ancient and Medieval Religious and Civil Law in India), Vol.5.2, 1st edition, 1962. Bhandarkar Oriental Research Institute. pp. 816–821. ^ Kane, P. V. "History of Dharmasastra (Ancient and mediaeval Religious and Civil Law), v.5.2, 1st edition, 1962 : P. V. Kane". p. 816. ^ a b c d P. V. Kane. History of Dharmasastra (Ancient and Medieval Religious and Civil Law in India), Vol.5.2, 1st edition, 1962. Bhandarkar Oriental Research Institute. pp. 816–817. ^ Patrick Olivelle (1998). The Early Upanishads: Annotated Text and Translation. Oxford University Press. p. 259. ISBN 978-0-19-535242-9. ^ Dimmitt & van Buitenen 2012, p. 7. ^ a b Dimmitt & van Buitenen 2012, pp. 7-8, context: 4-13. ^ Klaus K. Klostermaier (5 July 2007). A Survey of Hinduism: Third Edition. SUNY Press. pp. 59–. ISBN 978-0-7914-7082-4. ^ Pargiter 1962, pp. 30–54. ^ Monier-Williams 1899, p. 752, column 3, under the entry Bhagavata. ^ John Dowson (2000). A Classical Dictionary of Hindu Mythology and Religion, Geography, History and Literature. Psychology Press. pp. 62–. ISBN 978-0-415-24521-0. ^ R. C. Hazra, Studies in the Upapuranas, vol. I, Calcutta, Sanskrit College, 1958. Studies in the Upapuranas, vol. II, Calcutta, Sanskrit College, 1979. Studies in Puranic Records on Hindu Rites and Customs, Delhi, Banarsidass, 1975. Ludo Rocher, The Puranas - A History of Indian Literature Vol. II, fasc. 3, Wiesbaden: Otto Harrassowitz, 1986. ^ Vayu Purana 1. 31-2. ^ Flood 1996, pp. 104-110. ^ a b c d Rocher 1986, pp. 14-15 with footnotes. ^ Rocher 1986, pp. 15 with footnotes. ^ Barbara Holdrege (2012). Hananya Goodman, ed. Between Jerusalem and Benares: Comparative Studies in Judaism and Hinduism. State University of New York Press. p. 110. ISBN 978-1-4384-0437-0. ^ D. Lawrence Kincaid (2013). Communication Theory: Eastern and Western Perspectives. Elsevier. p. 165. ISBN 978-1-4832-8875-8. ^ Ludo Rocher (1986), The Puranas, Otto Harrassowitz Verlag, ISBN 978-3447025225, pages 1-5, 12-21, 79-80, 96-98; Quote: These are the true encyclopedic Puranas. in which detached chapters or sections, dealing with any imaginable subject, follow one another, without connection or transition. Three Puranas especially belong to this category: Matsya, Garuda and above all Agni. ^ Gregory Bailey 2003, pp. 139-141, 154-156. Wikimedia Commons has media related to Puranas.